The contract between SMST Tubes France and Fives Bronx Limited was signed in Montbard (France) during August, 2015. 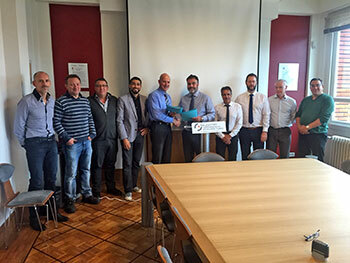 Fives are delighted to announce that they have further cemented their position as a world leader in the supply of tube and pipe straightening equipment, with the signing of a contract between their UK-based entity, Fives Bronx Limited and Salzgitter Mannesmann Stainless Tubes France in Montbard. The new contract is for the supply of a six roll 6CR10-HD straightening machine, complete with ancillary electrical and hydraulic control systems. The equipment has been purchased to process high-yield stainless steel tubes up to 280mm in diameter, and at wall thicknesses of up to 50mm. Jon Dunn, Managing Director at Fives Bronx Limited, explained that “the order was secured as a result of numerous technical and commercial exchanges that took place, over a 2 year period. Despite fierce competition from several European manufacturers, we were able to convince the client to invest in Bronx, mainly based on our experience on similar straightening applications - a fact underlined by our extensive customer base. The equipment will be subject to a full - inspection in the U.K. prior to it being delivered to SMST Tubes France in August, 2016.